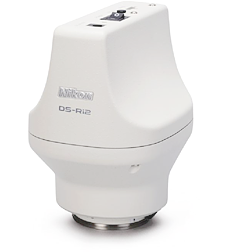 TOKYO - Nikon Corporation (President: Makoto Kimura) is pleased to announce the release of digital cameras for microscopes DS-Ri2 and DS-Qi2. These are the first Nikon digital cameras for microscopes in the Digital Sight series equipped with a Nikon FX-format CMOS sensor. They offer 16.25-megapixel high-definition images. The DS-Ri2 provides superior color reproduction and fast frame rates. 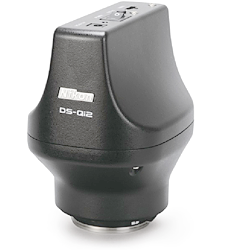 The monochrome model DS-Qi2 enables high-sensitivity, low-noise images. Since their release in 2003, Nikon’s digital cameras for microscopes in the Digital Sight series have gained a strong reputation among universities and laboratories in the medical and biological fields and at industrial R&D and inspection sites. Digital cameras for microscopes require not only high-definition image acquisition but high reproducibility for correct sample colors, high sensitivity and low noise to capture weak fluorescence signals. Nikon has optimized the digital SLR camera CMOS sensor and image processing technologies for microscope imaging to develop a high-definition color camera and a high-sensitivity monochrome camera. Display and analysis of captured images is possible with optional imaging software NIS-Elements. DS-Ri2 offers 16.25 megapixels. The newly equipped CMOS sensor for Nikon FX-format digital SLR cameras (36.0 x 23.9 mm image size) enables one-shot capture of high-definition images. It also allows faster imaging than pixel shift imaging comprising multiple-shot images, and reduces vibration during image capture. The newly developed image processing engine is ideal for brightfield imaging of pathological samples, which require high-color reproducibility. The large pixel size (7.3 um pixel pitch) allows weak light to be captured by each pixel and the low-noise circuit design is optimized for microscope imaging. These enable sensitivity control from ISO200 to ISO12800, and high-sensitivity fluorescence imaging with reduced noise. Thanks to the USB3.0 computer connection and CMOS sensor, which provides high-speed data readout, the frame rate has been significantly improved to 45 fps (1636 x 1088 pixels), from 19 fps (1280 x 1024 pixels) with the conventional model. This enables fast live-image display and easy observation point selection and focusing. The newly developed 16.25-megapixel monochrome CMOS sensor for the monochrome digital camera for microscopes offers 36.0 x 23.9 mm image size. The S/N ratio is five times better than that of conventional models, with quantum efficiency*1 up to 77% and 2.2-electron readout noise. In addition, Peltier cooling (electronic cooling) reduces dark-current noise*2 and produces clear images with reduced noise even with dark fluorescent specimens. *1Conversion efficiency from light to electrical signals. *2Noise caused by heat from the sensor during lengthy exposures. Low ± 1% linearity error of output power to input light intensity enables correct measurement of changes in brightness of specimens. Thanks to the USB3.0 computer connection and CMOS sensor, which provides high-speed data readout, the frame rate has been significantly improved to 45 fps (1636 x 1088 pixels), from 19 fps (1280 x 1024 pixels) with conventional models. This enables fast live-image display and easy observation point selection and focusing. *Optional mount adapters are required for mounting cameras on microscopes. This information is current as of the date of publication. It is subject to change without notice.